I use a smaller than pea size piece of tacky wax on each piece. Removing the shade is always a concern for the first few you may do. I use a two stage heating process to make the job easier. I first heat the inside of the shade as evenly as possible to get the fiberglass warm to the touch. Let it sit for a couple minutes and then heat the outside of the shade evenly. For the inside heating, I use either a hot air popcorn popper or a heat gun. While the outside is heated using either a heat gun or a hair dryer. About the glass work: i follow the traditional method of selecting the glass on a light table which uses the same bulbs as the lamp will use. As I am finished cutting the pieces, they are placed on a easel which shows how the shading is doing and at this stage I replace pieces which don't fit the picture (color scheme). After all the glass has been cut and the glass on the easels has passed the test, I begin fitting the pieces to the form using only a very small amount of wax because the pieces have to be removed in groups to be foiled. Once the pieces have been foiled they are put back on the form with the 'smaller than pea' size wax. 1. The huge (coffee table) book "Stained Glass" by Francis Stephens, George Seddon, Lawrence Lee, published in 1992. This one is full of the history of stained glass. Many examples from all eras of cathedral building and other uses. Also chapters on contemporary stained glass and restoration work. It's just $4.00 with free shipping - 208 pages, large format. Stated as "acceptable" condition. #47998 How To Add Hooks To Large Mirror? I would use copper wire, stranded may be safer & last longer than one solid wire. On the backside, start the wire near the bottom of the mirror and run along the lead line, about 2/3 the way up. Make a nice loop and run the wire back down to where you started. One wire loop on both sides of the project, well soldered will be stronger than just adding two loops. (See red line in pic below) Mirrors are often hung with a stranded wire (picture hanging wire) attached to those two loops. Horseshoes have nail holes in them? Solder a copper wire to your glass project, run the wire through the hole, solder the other end of wire to backside of project. 2 or 3 wires should be all you need. Quick & Easy! I think the first thing I would do it just take a deep breath and relax. If you notice the putty is crumbling out or a dust is forming on the sill I would suggest wiping it up with a wet rag so that the dust sticks to the rag and then toss the rag away. If the window is in the condition you are describing I would suggest not touching it at all. Pressure from a cleaning would possibly disturb loose putty, cause lead joints to "crack", or stir up this oxide that you see. If you notice a cobweb you can lightly dust it... Let it be. Don't move! Appreciate it! Most of all relax and don't eat or lick it, no matter how appetizing it looks. #49089 Homasote Board Or Plywood Board Work Surface? Homasote is great for small projects and push pins will slide easily into the board. Cover the surface with paper to help keep it clean. Change the paper when it gets dirty or cut. Plywood is better if you want to solidly attach straight boards along two edges. Also works better for larger projects where you might need to pick up the board and move it around, less likely to bend. Doing a panel with lead came and nails..........use plywood or MDF (particle board). Before I put a new grinder head on when I am replacing a worn out one I smear a nice heap of Tube Wax Lubricant from CR Lawrence inside the head. I find that later on down the road when I want to change it this helps in the "speedy" removal of the crusty old one. This doesn't help you in getting the one off that is stuck on, but it might help with the next one. These are my first and second lead pieces, I am self teaching myself so they are not perfect but are coming along. I do find lead easier to work with, we will see how running the beads go for this one. Not exactly a joke - well, not intended to be a joke - but these pictures are hilarious. #48185 Stright/shape And Oil/dry Cutters. What's The Best Chice? Yes, "personal preference" is very much a matter of ergonomics. It depends on the size, shape, and strength of your hand. I use many different cutters and when I had a glass shop, I encouraged students and customers to try ALL of the cutters I had. If you can find a shop with a patient proprietor, maybe you can do that, too. I had more than one person come in with a cutter they had bought somewhere else, complaining that the cutter didn't work. 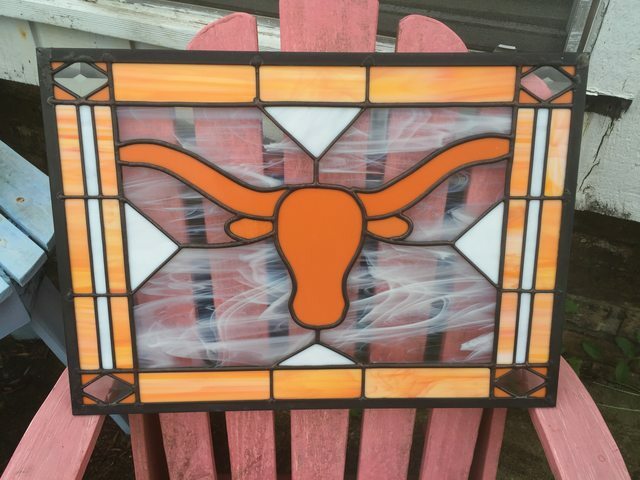 I would take them back to the scrap glass and show them how to use a cutter and let them practice with the one they came in with and also with ones I had on hand. Usually all they needed was a little "hands on." So if you are having trouble with cutting glass, you might need to see an experienced person do it. It's a little hard to get all the nuance from a book or video. Usually hot is used to mean glass blowing or torch work and warm is used to mean kiln work. #48000 How To Add Hooks To Large Mirror? I would take advantage of the back of the mirror not being seen and run a strengthening copper wire system on all your long verticals and horizontals, using these wires to tie into your chain. I would not rely on the decorative pieces being able to support anything structurally. #47649 What About Soldering Irons? #47325 Working With Small Round Nuggets. I usually solder the face first, then flip the panel over and lay it on a towel to allow the nugets to stick out, or make a cardboard base with a hole cut out for the nuggets.to stick through and solder the back. 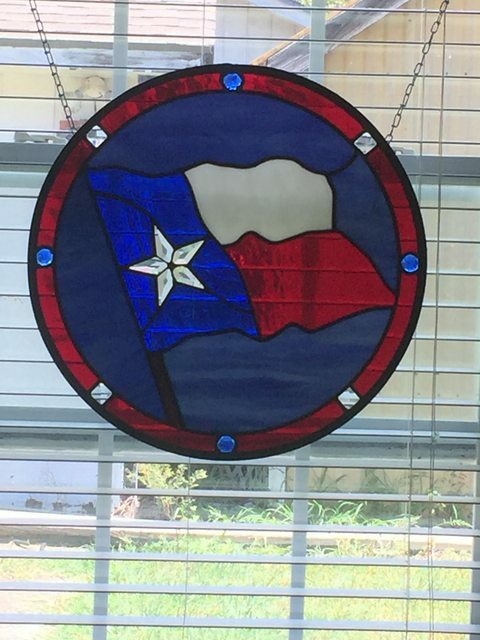 A 3-D item as a first project is a little ambitious, but do-able...I have been teach stained glass for 20 years, and have learned a little along the way. I teach my students to make a full size copy of they project on card stock..Cut out your template from the card stock. Lay the template on the glass, and trace around it with an extra fine paint pen. I have students who use a ruler with a cork back to cut straight lines, but caution them about making sure the ruler stays put. I always cut free hand, right on the line drawn around the template.. There are other ways to mark and cut your glass, so ask questions and watch videos. Soldering just takes practice to "perfect"...I have had Weller Irons, and been generally pleased with them..They should never glow in use..I use a Hakko, now, and it is the best Iron I have ever used..It is expensive, but worth every penny.. Welcome to the forum, and good luck on your new glass adventure. Thank you for the response, Mr Lampman... and with one exception I'll do my darndest to follow your lead. The only place I'd have problems is the advice to turning the iron off if stopping for 20 seconds. Wow. Here I am, adding pieces to my lamp shade form, one at a time. Guess if I learned to use a sticky wax to hold the foiled pieces and then solder all at once it'd work... but right now I'm cutting them all, foiling a few, soldering them to hold in place and then foiling the next few. But to progress without destroying my iron tip I guess I'll have to change. I understand what your saying. Waiting on reheat can take a lot of time, but irons are not made to run idle without being used to get rid of excess heat. It destroys tips. By all means figure out a way to do several pieces at one time, tack them at one time, and then do the soldering. If I am doing a shade, and replacing a bunch of pieces, I sometimes get out the old Weller Soldering gun, like the ones you get from a hardware store with a trigger. It heats quick, and I use it only to tack a piece into place. Its all you need to tack pieces. Then you can use the good iron to do the finish. #46590 Ae Pattern Books Going Out Of Style? Many, many pattern books for stained glass are available from eBay. Many pattern-like drawings are available in coloring books. Many readily available line drawings can be adapted to stained glass work. Many images, even though they are not line drawings, can be used as sources for stained glass ideas, too. Ultimately, it makes sense to try to learn how to create our own patterns, either exclusively or occasionally - my opinion, but it can't hurt to try! The issue will become more complex as you add bevels, jewels, globs, etc. to your work, as these are definitely thicker than your standard glass. Usually, with these, you want the extra thickness on the front, so you must solder front side first. So, what would you do about variable thickness in the rest of the glass then? I don't think 1.5 or even 2x variability is worth worrying about. Just makes the soldering job a little more challenging. I solder a lot of fused and formed pieces into my work, and these pieces have a lot of depth, like sometimes up to an inch. I like that my panels aren't flat. I like when people touch my panels just to be sure they aren't really flat. I usually put the extra depth either in front or back, depending on how I want the piece to look, but sometimes I have extra thickness in front AND back, which makes assembly tricky! I line my grinder trays with aluminum foil, then after draining most of the liquid, just lift the solids out on the foil and throw away. I used to use the paint scraper method, but this keeps things a lot cleaner around the edges.